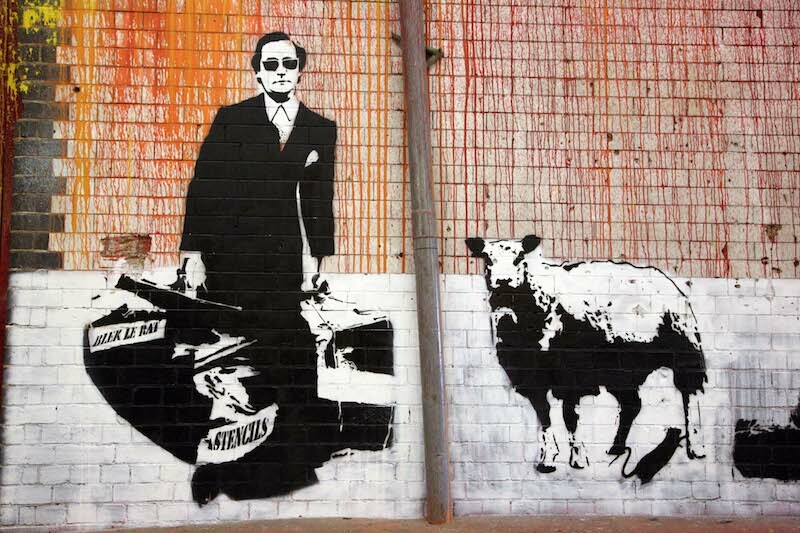 Stencils by Blek le Rat at Cans Festival in London in 2008. Photo by Bruno Girin. In the days when information about what was going on with graffiti and street art outside of one’s own city was extremely limited, the result was that cities often developed quite distinct styles. A prime example of this took place in Paris in the 1980’s. Xavier Prou aka Blek le Rat believes that when he began making street art in Paris in 1981, there were two other active street artists in the city and any graffiti was political graffiti. Prou’s trademark style was the use of stencils combined with spraypaint, which he says was unique in Paris at the time. New Yorkers like John Fekner and David Wojnarowicz were also using the technique on the other side of the Atlantic, but, like New York-style graffiti, stenciling had not reached Paris before Prou’s work. In 1983, Prou began seeing the first in a long line of artists who were inspired by him to make street art using stencils. He estimates that by 1986, when the French newspaper Libération ran an article with the headline which translates to “The school of Blek le Rat,” there were literally hundreds of other stencil artists in Paris with only a handful of street artists using other mediums. People had taken notice of Prou’s work, were inspired, and Paris became the stencil art capital of the world. Stenciling so defined the early days of Parisian street art that Prou’s influence is still felt there today, even if his influence is a generation removed and it is the artists whom he inspired who are now the ones influencing the younger Parisian stencil artists. Maybe if Prou had been interested in wheatpasting abstract patterns, that would have become the distinctive style of French street art, but he started with a stencil. With limited access to information about the street art and graffiti in other cities, regional styles were often the result of stylistic seeds being planted and then other artists picking up those ideas and running with them, unaware of what art might be being made just a few hours away.